Despite the cold and snow that blankets the state for months, Mainers love their ice cream. Spring doesn’t officially start in Maine until Red’s Dairy Freeze and Beal’s Ice Cream scoop their first cones of the season. From one end of the state to the other, you’ll find great homemade ice cream in Maine! Here are our 11 favorite spots to get it. You know spring is on the way when Red’s Dairy Freeze opens the first weekend of March. Red’s has been serving the Greater Portland community with the finest soft-serve ice cream and frozen yogurt since 1952. Don’t miss their famous local strawberry soft-serve or their secret off-menu Boston Shake. Owned by Italian immigrants, Gorgeous Gelato in the heart of Portland’s Old Port produces some of the best gelato west of Italy. Locals and tourists alike love the velvety texture and intense flavors of their gelato. Popular flavors include pistachio and vanilla, wild berries, and Tiramisu among others. Made in Bar Harbor and Portland, Mt. Desert Island Ice Cream uses only the finest ingredients to create delicious and creamy ice cream by the cone. Yankee Magazine even named them the “Best of New England” last year. Enjoy everything from butter beer to Maine maple walnut to vanilla. You can’t go wrong with whatever you choose. Gifford’s is one of Maine’s oldest and most popular ice cream shops. The company dates to the 1800s when an industrious young man started a home milk and ice cream delivery business from the back of his horse-drawn wagon. Five generations later, Gifford’s is still going strong, selling cones in multiple stores and gallons in the local supermarkets across the state. Houlton Farms Dairy Bar operated seasonal ice cream shops in Houlton, Caribou, and Presque Isle once the snow melts in Northern Maine. Known for its delicious fresh fruit flavors and their Awful Awful milkshake, there is no question why Houlton Farms Dairy Bar is one of the best ice cream shops in Maine. Just like Red’s, Mainers know that spring is on the way when Beal’s opens their four locations in the Greater Portland area. Beal’s uses only the finest ingredients and their own secret formula to handcraft small batches of over 100 different recipes like German fudge cake, salted caramel, and coffee Oreo. Their soft serve is also amazingly delicious. Founded in 2009, Stone Fox Farm Creamery has quickly become a premium ice cream in Maine. Each ice cream flavor is extremely creamy and uses only premium, all-natural ingredients from local producers. Stone Fox Farm has over thirty flavors, including some seasonal, so you will find a flavor that makes your taste buds dance. 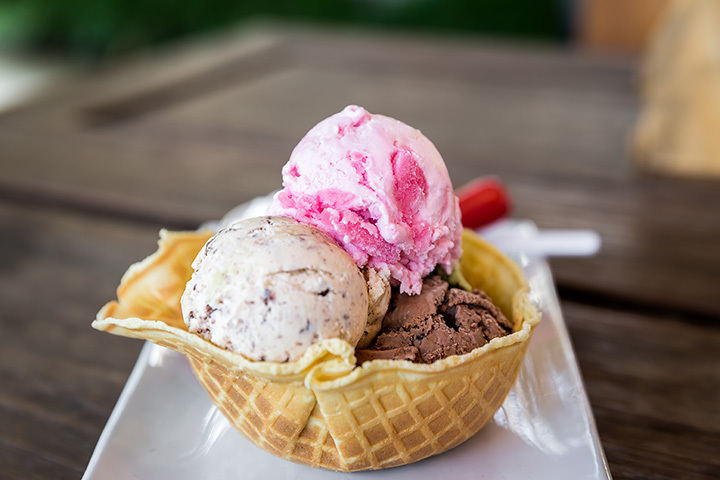 Rococo produces delicious artisan ice cream flavors like banana split, cantaloupe, and goat cheese blackberry chambord. Some of their flavors might have you questioning their pairings, like sweet avocado cayenne, but after the first bite, you’ll know why Rococo’s is one of the best in the state. You can try their unique flavors in Kennebunkport, Ogunquit, Bob’s Clam Hut, and Brewsters Market. Nothing is better than farm fresh ice cream right from the source! Situated on 500 acres in Westbrook, Smiling Hill Farm has been producing dairy products since the 1700s. Their Dairy Shops sells milk, cheese, and yummy ice cream. With over 40 flavors, you can’t go wrong! Toots Ice Cream in North Yarmouth is a local favorite. Toots has been serving ice cream out of a train car on her family farm for years. Toots has one of the most extensive list of flavors, but the menu changes daily so call ahead if you’re have a specific craving. The most popular flavors are black raspberry, Coconut Willy, and Royal River Brownie Sundae. You know an ice cream shop is going to be good when they have the flavors handwritten. With over 100 options, Round Top may just become your next favorite spot to get ice cream in the state. This no-frills spot serves homemade soft-serve, gelato and sorbet.